Exhibition at the Design Center Stuttgart. PUL Engineers is represented with several bridge-projects. PUL Engineers was commissioned with the planning of the extension of subway line U15 by the Civil Engineering Office of the city of Stuttgart. Roofing structure and fittings of three stations on line U15 were to be planned. Traffic is now opened for the “Pedestrian and Cycle Bridge” crossing Bundesstraße B27 in Tübingen-Nehren. The project was developed in cooperation with the architecture office Roland Bogenrieder. Highway bridge over the Nesse valley. With an overall length of 414 m the bridge was build as part of the the A4 in Thuringia, Germany. Completion of the structural work for the industrial buildings and reinforced concrete containers, the assembly of steel constructions begins. After a 14-week construction period 11 of 13 sections of the tower shaft are completed. The tower shaft height now measures 56.40 m. The air traffic control tower, made of reinforced concrete, will measure 70 m as a finished structure. The steel sculpture at the Augusten-Roundabout in Schorndorf was designed by the artist Robert Schad. It is composed of three bent steel pipes as square hollow profiles with a total length of approximately 10 m with a sculpture height of about 6,50 m.
Within the project “Assisted living in Wupperaue” a two-storey building will be created, consisting of two bars and a glazed atrium with basement under and underground parking. The client is the owner community Frielingsdorf. PUL implements the structural and detailed design. The new part of the main building of the AOK regional office Bodenseekreis has been taken into operation. The building was constructed as a branch of the BW Bank, commissioned by the Landesbank Baden-Württemberg in Böblingen. The supporting structure is designed as a spatial structure of disks, plates and supports in reinforced concrete. The challenge in construction projects often lies in the integration of different and diverging disciplines. The multi-functionality of components as an architectural design element, physical barriers, carrier media and parts of the structure require the integrative cooperation of all planners involved. 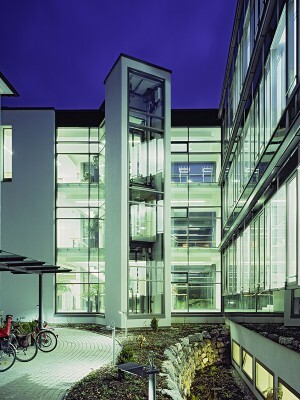 The new building of the BW Bank in Böblingen (architect: Kauffmann Theilig und Partner) is an example of such an integrative effort. Through extremely careful planning it is possible to dissolve highly stressed structural points, such as a cantilevered shear wall, while following the architectural concept, and to make use of them as support for facade embellishments and utility lines. The spatial Finite-Element-Model was an important component in the development of the structure. Our entry for the comnpetion for the highway bridge crossing the Rhein near Schierstein wins the 2. prize. 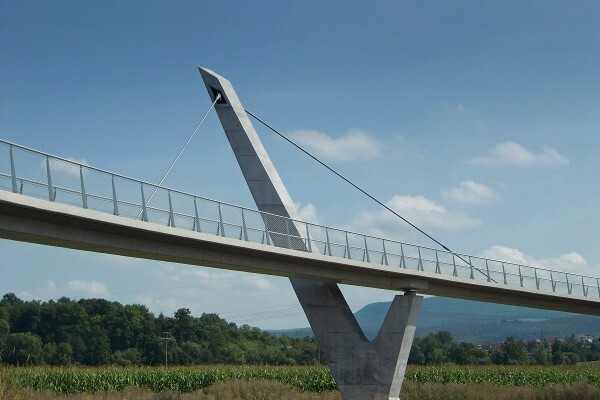 The pedestrian and cycle bridge in Kirchheim-Rohrbach, Heidelberg, was awarded the 2nd prize. It was designed in collaboration with the architects asp (Arat Siegel & Partner). The structure consists of two curved concrete structures. The paved surface lies on a slender, curved T-beam with a 6% slope, supported by steel columns.